Dr. Schaefer moved to Wallowa County in 1988 with his Canadian wife Kathy and raised 3 daughters here. All of his daughters have graduated from college. Dr Schaefer has a small flock of sheep and enjoys photography, computers and genealogy. He and his family are members of Enterprise Christian Church. 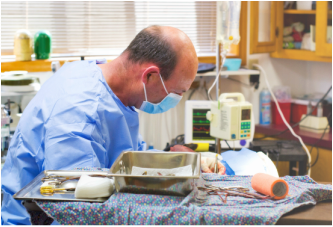 Dr. Schaefer has been practicing at the Double Arrow Veterinary Clinic since 1988. Dr. Greenshields moved to Wallowa County in 1994 after graduating from Washington State University's College of Veterinary Medicine. Prior to that, he received his Bachelor of Science degree in Biology from the University of Puget Sound in Tacoma, WA in 1990. Dr. Greenshields and his wife, Jeni, have raised their 4 kids, one daughter and 3 sons, here and can't think of a better place to raise their family. Dr. Greenshields enjoys watching his kids in their many sporting events, riding his horses and mule in the Eagle Cap Wilderness, bowhunting, trail running, and camping and hiking with his family. Dr. Greenshields is involved with many of our local community events (Chief Joseph Days Rodeo, Mountain High Broncs and Bulls, Wallowa County Fair and 4H clubs). He has been involved with our local sled dog race, the Eagle Cap Extreme, since it's inception in 2005 and has been the President for the last several years. Dr Greenshields has been practicing at the clinic since 1994. Dr. Neveau, a Texas native, moved to her husband's hometown of Enterprise in 2012 while he was deployed to Afghanistan with his Medevac unit. Graduating in 2004 with her Doctorate from Texas A&M University, she then elected to spend her first year of practice in specialized training as an Equine Intern at Louisiana State University's Veterinary Teaching Hospital. Following one year of equine ambulatory practice in Louisiana, she practiced in small animal general practice in Texas for seven years before moving to the Wallowa Valley. When not practicing medicine, she and her husband spend their days running after their toddler daughter and kindergartner son as they work on their farm in Imnaha. Her furry family includes 2 horses, 2 cows, an assortment of sheep, and a kitten. Whenever life slows down enough for hobbies, Dr. Liz enjoys riding, gardening, cooking, and all manner of crafty things.